MANCHESTER, England -- Duje Draganja has set a world record in the men's 50-meter freestyle at the short-course swimming world championships. 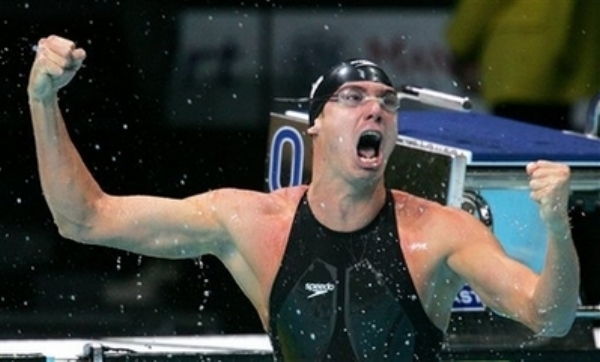 The Croatian swimmer, wearing Speedo's LZR Racer suit, finished in 20.81 seconds Friday, breaking the mark of 20.93 set by Sweden's Stefan Nystrand in 2007. Through three days of the meet, seven world records have been broken. As a swimmer, Duje Draganja is used to quick turns, but this was absurd. In the last several months, the pride of the University of California and Split, Croatia, has 1) broken his hand slamming it on the wall of the pool at Berkeley's Spieker Aquatics Complex, 2) taken the silver medal in the 50-meter sprint at the Athens Olympics, 3) won a bronze at the world championships in Indianapolis, 4) been involved in an accident in which he was momentarily trapped in a burning sports car and 5) won five medals in the Pac-10 championships. Swimming may be a country-club sport for many collegians, but not for Draganja. The pool he trained in as a kid still has bullet holes from the civil war that ravaged the former Yugoslavia. At a park where Draganja went to play soccer with other kids, a Serbian soldier trained his semi-automatic weapon on him. It was that kind of a childhood. Talking about war seemed incongruous on a sun-kissed day in Berkeley. He was sitting by the Spieker pool as his teammates churned the water in preparation for the NCAA championships in Minneapolis on March 24-26. With a big hand from the 6-foot-5, 178-pound Draganja, Cal scored its first dual-meet triumph over Stanford in 14 years, but finished second to the Cardinal at the Pac-10s in Long Beach. Now the Bears will send their largest-ever contingent, 18 swimmers, to the nationals. Don't call him Doo-ie, by the way. "Everybody tells me that's the dumbest name you want to have,'' Draganja said with a laugh. It's DU-ya DRAG-on-ya, if you please. At the nationals, the public-address announcer should get plenty of practice at it. Draganja, 22, has the fastest times this season in the 50 (19. 22), the 100 freestyle (42.14) -- teammate Rolandas Gimbutis is second at 42. 54 -- and the 100-meter butterfly (45.63). He won all three finals at the Pac-10 meet and helped Cal win two relays, but he was not voted Swimmer of the Meet. That honor went to Stanford's Gary Marshall, who broke three conference records. Nort Thornton, Cal's head coach for more than three decades, thought Draganja should have won it, but dismissed any talk of a backlash by the other coaches against a foreigner. "I hope not because almost every team in the conference has at least one (import),'' Thornton said. Taking a trip to the coastal city of Dubrovnik to visit his father after the world championships in October nearly cost him his life. Exhausted from the grueling training and endless public appearances, he was driving a rented Mazda RX8 that hit a rock in the road on a rainy morning. The impact on a wheel caused the car to slide into a wall. "The car caught on fire while I was in there,'' he said. "I couldn't open my doors or windows. My right hand got burned a little, and my feet, too." He managed to escape but sustained a slight concussion and had to wear a neck brace for a week. His training was set back a couple of months. This was big news in Croatia, where Draganja had been named Athlete of the Year for his Olympic medal, one of five by that country. He took second in the 50 just 29 minutes after placing seventh in the 100 fly. He also stirred a controversy in the Games by insisting on wearing his Cal swim cap. Some people back home thought he was snubbing his country, but they later got over it. That he did well in the Olympics in August is a tribute to his recuperative powers. He had broken his hand eight weeks earlier while practicing finishes at Cal. Wow - this article is truly amazing! Is there anybody out there who has ever tried to swim 25 meters in under 20 seconds, let alone 50!? This guy covers 2.50 meters a second! Try it and fail embarrassingly!